Diplotaxis tenuifolia.Luigi Rignanese.luirig.altervista.org. (Accessed 11/2014). 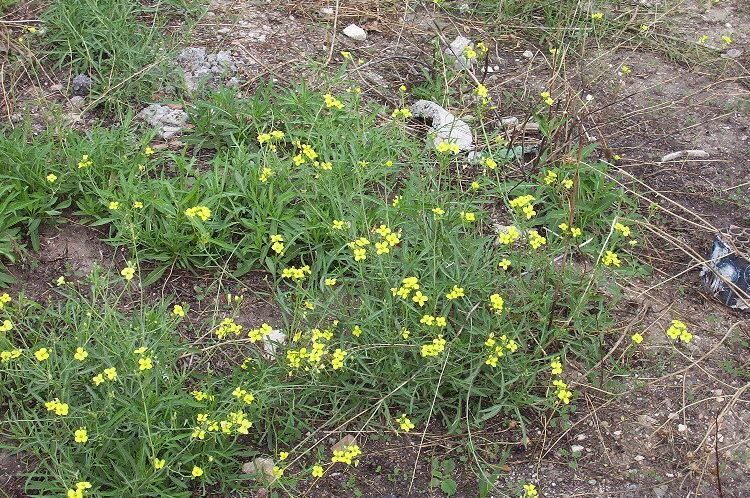 Diplotaxis tenuifolia is a perennial herb from a taproot, erect 20-50 cm tall, stems branched from base, leafy up to inflorescence. Leaves alternate, mostly basal, oblanceolate, toothed to pinnately divided, lobes narrow, toothed, waxy-pale, rather fleshy, unpleasant odor when crushed. Flowers yellow, 4-parted, petals widest near top, narrowed to base; blooming July-Oct.
Fruit dry, linear capsules 2-parted, to 5 cm long on stalks to 3.5 cm; seeds in 2 rows on each side of the midline septum. Habitat: Open weedy sites, roadsides.